Claudine Westhoff, 92, of St. Paul, and formerly of Walnut and Erie passed away at 2:59 p.m., Friday, March 8, 2019 at the Prairie Mission Retirement Village in St. Paul. Claudine was born on December 11, 1926 in Nevada, Missouri to Samuel Claude and Mary Candacia (Miller) Hiestand. She moved to Girard with her family where she spent most of her childhood. She attended Girard schools and graduated from Girard High School. She married John Leo Westhoff on August 16, 1955 at St. Michael’s Catholic Church in Girard. He preceded her in death on January 25, 1975. They were blessed with five children, nine grandchildren, and nine great-grandchildren. Claudine in her younger years enjoyed square dancing. In fact Claudine met her husband at a square dance and that is where their story began. Claudine began her life as a wife, mother, and homemaker. She enjoyed sewing, playing pitch 31, checkers, reading, singing, and baking. She loved sharing her baked goods with friends and family. Especially her homemade bread! She had a special talent for caring for the mentally handicapped. Later in years she used this talent while working at the Living Skills Center. She also worked at Arkhaven Nursing Home in Erie. 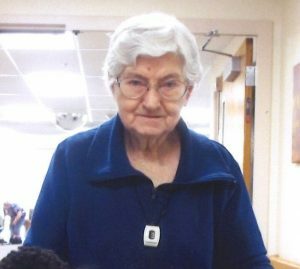 Once Claudine chose Prairie Mission Retirement Village as her home you would often see her in the dining room wrapping silverware or visiting with a staff member or another resident. She always felt the need to keep busy and help others. Playing noodle ball always put a smile on her face. She is survived by her daughter, Mary Jo Little, and her, husband, Bob; her son, Claude Westhoff, and his wife, Kathy all of Walnut; nine grandchildren; nine great-grandchildren; and several nieces and nephews. In addition to her husband Claudine was preceded in death by her sons, Ron Westhoff, Michael Westhoff, and Eric Westhoff; her sister, Ella Mae Horton. Mass of Christian Burial will be held at 10 a.m., Wednesday, March 13, 2019 at the St. Francis Catholic Church at St. Paul with burial following in the St. Francis Cemetery. Friends may call the Carson-Wall Funeral Home in St. Paul from 9 a.m. to 5 p.m. Tuesday at which time her casket will be moved to the church. The Rosary will be recited at 7 p.m., Tuesday at the church with visitation following the rosary. Memorials are suggested to the St. Jude Children’s Research Hospital or to the Prairie Mission Retirement Village and these may be left at or mailed to the funeral home 403 Main St. St. Paul, KS 66771. Online condolences may be left at www.wallfuneralservices.com.